Published By: David Gerbino, a FinTech, bank, and data-driven marketing consultant and NYPAY.ORG board member based in the New York City metropolitan area. Financial startups built on digital platforms are leading the charge to democratize advanced technology and superior UI/UX for banks and credit unions. Asset size is no longer a limitation that holds back banks and credit unions from implementing advanced technology. If a $150 million asset-sized credit union can have a more advanced consumer lending platform by partnering with a start-up than the nation’s top banks, than any bank or credit union can. New partnerships between banks and credit unions have been plentiful for well over a decade. According to McKinsey & Company, “Absent any mitigating actions by banks, in five major retail banking businesses – consumer finance, mortgages, lending to small and medium-size enterprises, retail payments, and wealth management—from 10 to 40% of bank revenues (depending on the business) could be at risk by 2025. Attackers are likely to force prices lower and cause margin compression.” While the hype has been focused on how new startups selling directly to consumers will disinter mediate banks, there are several examples of where innovation is being build with legacy banks and credit unions in mind. Many bank and credit union marketers are challenged with using marketing to originate loans. Historically, they only competed with other banks. Now they compete with marketplace lenders (MPLs). MPLs have even encroached on traditional bank marketing channels like direct mail. The inability of any marketing channels to reach consumers needing a loan at their zero moment of truth (ZMOT) is an additional impediment to a bank marketer’s ability to grow loan balances. Financial technology start-ups are continuing to create exciting solutions to get funds into consumers’ hands. One example is Affirm, a company that currently offers installment loans to consumers at the point of sale. On the heels of raising $100 million in funding, they have plans to create more products and services that will be offered directly to consumers. Innovation in digital technology moves fast. How fast? Two weeks after announcing their funding, Affirm announced their acquisition of PFM app Sweep. This type of competition will be a challenge for most banks to overcome as their traditional legacy products and services, user experiences, and technology can’t compete. Financial organizations and bank marketers need help. 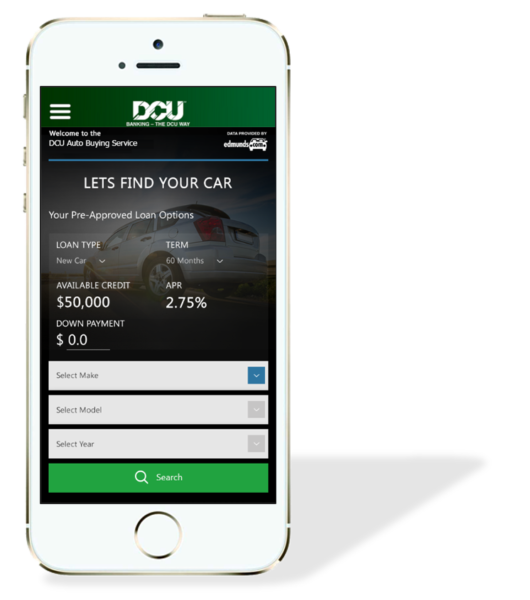 The next big innovation in lending is contextual loan offers to car shoppers. The good news for banks and credit unions is that the company behind this innovation is CuneXus. CuneXus, a leader in omnichannel, application-free lending technology, has been delivering leading digital consumer lending solutions to banks and credit unions with asset sizes from $150 million to $10 billion for years. CuneXus has removed the biggest piece of friction in the consumer lending process: the application. In 2014, they launched their lending platform, cplXpress (Comprehensive Pre-Screened Lending Express) at Finovate Spring. This product is an always-on lending dashboard based on each partner financial institution’s existing lending criteria. The latest innovation from CuneXus is called AutoXpress. The platform gives banks and credit unions an end-to-end auto purchasing experience. 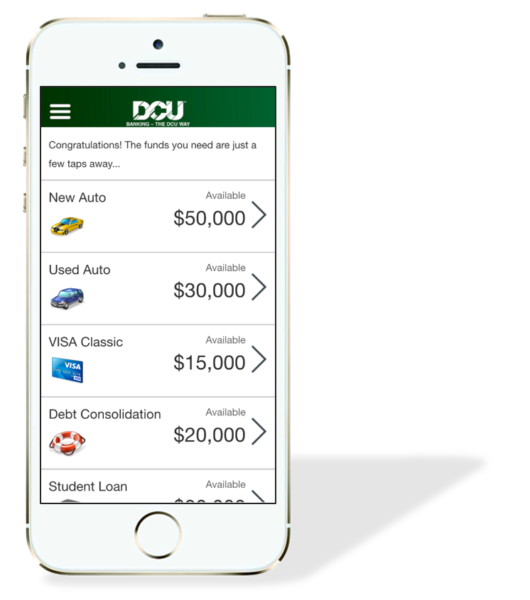 CuneXus debuted this technology at Finovate Spring 2016, showcasing the integration with the DCU (Digital Credit Union) mobile app. DCU, with nearly $7 billion in assets, is the largest credit union based in New England. To build out this platform, CuneXus partnered with Edmunds.com. AutoXpress is built directly into the cplXpress platform. This new capability shows the consumer their pre-approved car loan amount, term, and rate. The partnership with Edmunds adds the capability of providing 100% guaranteed pre-negotiated vehicle pricing of the car dealer’s inventory. This all happens within the partner bank or credit union’s mobile banking app. Edmunds has this capability with nearly 14,000 car dealers nationwide. Other partnerships will also provide a GAP policy and an array of competitive auto insurance quotes. CuneXus also partnered with the marketing technology provider, MobileRQ, a pioneer in contextual mobile marketing. 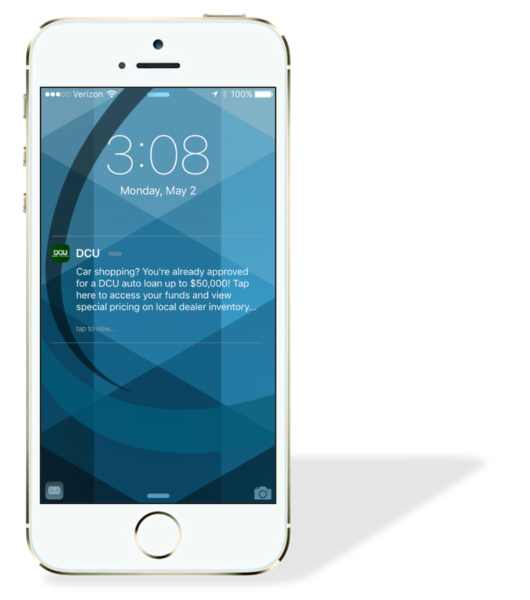 MobileRQ’s technology drives the targeting and personalization capability of the platform, including location-awareness and the tailored notifications. 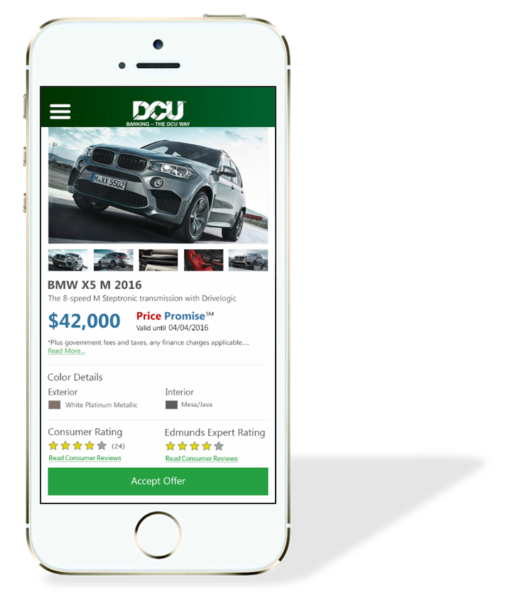 A customer can walk onto a car lot and MobileRQ’s geo-targeting technology enables a push notification to reach that customer’s smart phone, reminding them they have a pre-approved auto loan available. A link takes them to the mobile banking app, showing their loan options – amount, rate, term, etc. The financing is taken care of, they’re pre-approved and no application is necessary. CuneXus is not the only bank friendly digital loan solution company. Avoka, with their digital engagement platform “Avoka Transact for Financial Services,” is a frictionless sales platform for originating loans. They offer a great solution for acquiring new to bank loan customers. How easy is their platform? Watch the Avoka Finovate Spring 2015 demo where they demonstrate filling out a mobile web browser optimized loan application to a non-bank customer in under five minutes. Many banks have begun to embrace working with marketplace lenders (MPLs). The most notable are core banking provider Jack Henry & Associates and Chase Bank, who have deals in place with OnDeck Capital. Other banks also work with one or more of the MPLs, and some banks have built their own competing platform. CuneXus has partnered with the Crowdnetic Gateway to allow the integration of multiple marketplace lenders into the cplXpress platform. This optional capability will allow banks to be the true relationship manager for their clients. The hype around new start-ups and venture capital investment is huge. According to “The Pulse of Fintech, 2015 in Review” report by KPMG and CB Insights, VC’s funded $13.8 billion in FinTech globally in 2015 ($7.7 billion was invested in the US). Banks and credit unions have to remember that there are a lot of startups that are building technology solutions with partnerships in mind. These solutions allow for improved customer experiences, solve real problems, enhance marketing ROI, and help improve the profitability of a bank’s consumer loan portfolio. They also allow a bank to use the advantage of its existing customer base to leverage exciting new technology to provide a superior experience that customers expect. Competing direct to consumer companies will have a hard time gaining scale compared to legacy banks who upgrade their data and digital capabilities and who partner with bank-friendly startups.